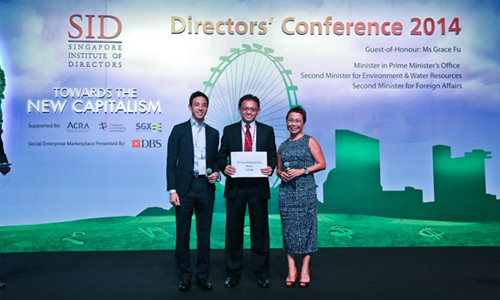 ECOSOFTT’s presentation was voted Best Social Enterprise Pitch by over 300 board members and senior management of Singapore’s largest companies at the Singapore Institute of Directors Conference 2014. The SID Conference is one of the largest gatherings of Singapore’s most distinguished corporate leaders. This year’s conference was held at the Marina Bay Sands on 3 September. In an event titled “Towards the New Capitalism”, corporate leaders learn about the innovative business models employed by social enterprises to create shared values. ECOSOFTT’s “4C Approach to Address Global Water Challenges” won the approval of these leaders and the S$10,000 prize.